The New England Numismatic Association is now seeking exhibits for November’s New Hampshire Coin and Currency Expo, November 13-14. The exhibit competition will take place on Saturday, November 14th, 2015 at the Radisson Hotel, Center of New Hampshire, Manchester, NH. The New England Numismatic Association is now accepting applications for this year’s Exhibits Competition. The competition will take place during our 71st Conference and Convention on Saturday, November 14th at the Radisson Hotel, Center of New Hampshire, Manchester, NH. One of the strengths of NENA in the past has not only been the numismatic bourse at the conventions but the education of fellow numismatists and the public through speakers, club meetings and exhibiting. Last year we had nine Exhibitors that included one Y.N. Exhibitor. As an incentive to get more Y.N. involvement in our Exhibit Program all youngsters under the age of 18 will receive a free one year Junior Membership for submitting an application and placing an Exhibit during this year’s Exhibit Competition. Exhibiting is a wonderful way of sharing, educating and imparting your knowledge to fellow numismatists and especially the public. The beauty of an exhibit can encourage others to collect similar material or may be attractive to people because of the numismatic knowledge people may learn. Exhibits can be competitive or Non-Competitive and set up not to compete but to show or impart numismatic information to the public. There is always a need for exhibits and they truly complement a good numismatic show. Below please find a copy of the Exhibit Rules and Application. The Application needs to be filled out letting the Exhibit Coordinator (s) know the time of arrival one is going to set up the exhibit. All exhibitors have a deadline to fill out and send an application with the title and numismatic area of exhibiting, and the Exhibits have to be set up by a certain time so that cases can be locked and judged. An exhibit would consist of a title, numismatic items and usually but not necessarily numismatic information. 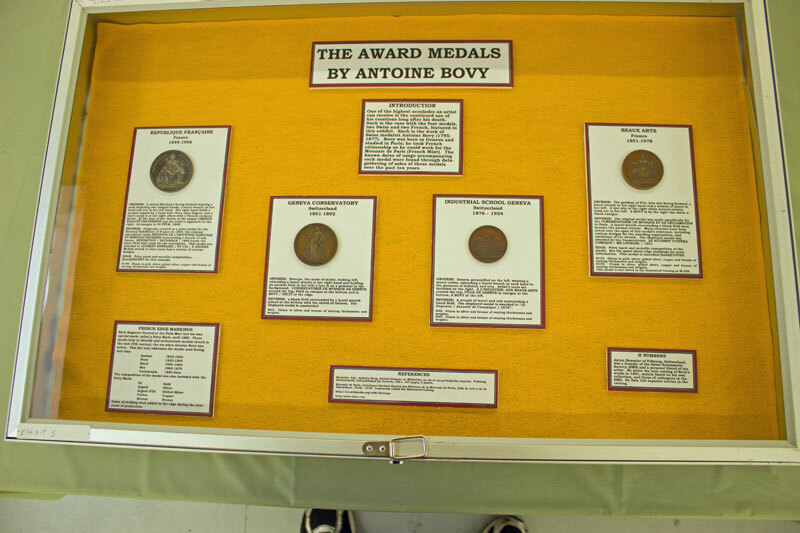 Numismatic information usually enhances an exhibit especially if the exhibiting is to be competitive with judging. On request NENA will provided the use of a display case if one is needed. Awards will be presented at the NENA Annual Meeting based on the overall rating of the Judges. The Best of Show award will be presented to the exhibit which has the highest overall rating and will receive an engraved pewter tray and a prize award of a 1/10 ounce gold Eagle. The People’s Choice Award will be decided by ballots cast by exhibit viewers and will receive an engraved plaque with a NENA medal affixed to it, also a 1oz. Silver Eagle. Junior Applicants under age 18 will also be eligible to receive a Y.N. Award Plaque for First, Second or Third Place. In addition the First Place Y.N. will receive a one ounce Silver Eagle. All Exhibitors will receive a NENA Exhibitors medal. Everyone has expertise in some collecting area, so if you are looking for a way to share this then exhibiting can be a wonderful way of doing it. NENA is always looking for people to set up and display an exhibit. If you have never set up an exhibit before notify NENA and we can help you. It is always a great learning experience. All Members of NENA in good standing and who submit a standard NENA exhibit application by November 6th, 2015 will be eligible to exhibit. NENA reserves the right to accept or reject any exhibit. Non-Competitive: An Exhibitor may enter only one competitive exhibit. Non-Competitive exhibits will be accepted on a space-available basis at the discretion of the Exhibit Chairman. Exhibits must be set up prior to 10 AM on Saturday, November 14th, 2015. Exhibits may be set up between 10AM to 6 PM on Friday November 13th, and between 9AM and 10AM on Saturday, November 14th. Exhibits may not be removed until after Awards Presentation. Exhibits must be removed before 5 PM on Saturday, November 14th. Each exhibit will be judged by at least two judges appointed by the Exhibit Chairman. During judging, all Exhibitors are excluded from the exhibit area. Judging will take place from 10 AM until 12 Noon on Saturday November 14th. Judges shall use the approved NENA Exhibit Rating Sheet and complete one sheet for each exhibit assigned. The Exhibit Chairman shall determine the overall rating for each exhibit by adding the ratings from each Judge and dividing by the number of Judges rating the exhibit. All Exhibitors will receive a NENA Exhibitors medal.